L. Frank Baum's story was first published in 1913. It is one of the six Little Wizard Stories of Oz. In a room of the Royal Palace of the Emerald City of Oz hangs a Magic Picture, in which are shown all the important scenes that transpire in those fairy dominions. The scenes shift constantly and by watching them, Ozma, the girl Ruler, is able to discover events taking place in any part of her kingdom. One day she saw in her Magic Picture that a little girl and a little boy had wandered together into a great, gloomy forest at the far west of Oz and had become hopelessly lost. Their friends were seeking them in the wrong direction and unless Ozma came to their rescue the little ones would never be found in time to save them from starving. So the Princess sent a message to Jack Pumpkinhead and asked him to come to the palace. This personage, one of the queerest of the queer inhabitants of Oz, was an old friend and companion of Ozma. His form was made of rough sticks fitted together and dressed in ordinary clothes. His head was a pumpkin with a face carved upon it, and was set on top a sharp stake which formed his neck. Jack was active, good-natured and a general favorite; but his pumpkin head was likely to spoil with age, so in order to secure a good supply of heads he grew a big field of pumpkins and lived in the middle of it, his house being a huge pumpkin hollowed out. Whenever he needed a new head he picked a pumpkin, carved a face on it and stuck it upon the stake of his neck, throwing away the old head as of no further use. "You'd better ride the Sawhorse, for he is swift and intelligent and will help you accomplish your task." "All right," answered Jack, and went to the royal stable to tell the Sawhorse to be ready for the trip. This remarkable animal was not unlike Jack Pumpkinhead in form, although so different in shape. Its body was a log, with four sticks stuck into it for legs. A branch at one end of the log served as a tail, while in the other end was chopped a gash that formed a mouth. Above this were two small knots that did nicely for eyes. The Sawhorse was the favorite steed of Ozma and to prevent its wooden legs from wearing out she had them shod with plates of gold. Jack said "Good morning" to the Sawhorse and placed upon the creature's back a saddle of purple leather, studded with jewels. "We're going to rescue two babes in the wood," was the reply. Then he climbed into the saddle and the wooden animal pranced out of the stable, through the streets of the Emerald City and out upon the highway leading to the western forest where the children were lost. Small though he was, the Sawhorse was swift and untiring. By nightfall they were in the far west and quite close to the forest they sought. They passed the night standing quietly by the roadside. They needed no food, for their wooden bodies never became hungry; nor did they sleep, because they never tired. At daybreak they continued their journey and soon reached the forest. Jack now examined the map Ozma had given him and found the right path to take, which the Sawhorse obediently followed. Underneath the trees all was silent and gloomy and Jack beguiled the way by whistling gayly as the Sawhorse trotted along. The paths branched so many times and in so many different ways that the Pumpkinhead was often obliged to consult Ozma's map, and finally the Sawhorse became suspicious. "Of course," answered Jack. "Even a Pumpkinhead whose brains are seeds can follow so clear a map as this. Every path is plainly marked, and here is a cross where the children are." Finally they reached a place, in the very heart of the forest, where they came upon the lost boy and girl. But they found the two children bound fast to the trunk of a big tree, at the foot of which they were sitting. When the rescuers arrived, the little girl was sobbing bitterly and the boy was trying to comfort her, though he was probably frightened as much as she. "Cheer up, my dears," said Jack, getting out of the saddle. "I have come to take you back to your parents. But why are you bound to that tree?" "Because," cried a small, sharp voice, "they are thieves and robbers. That's why!" "Dear me!" said Jack, looking around to see who had spoken. The voice seemed to come from above. A big grey squirrel was sitting upon a low branch of the tree. Upon the squirrel's head was a circle of gold, with a diamond set in the center of it. He was running up and down the limbs and chattering excitedly. "These children," continued the squirrel, angrily, "robbed our storehouse of all the nuts we had saved up for winter. Therefore, being King of all the Squirrels in this forest, I ordered them arrested and put in prison, as you now see them. They had no right to steal our provisions and we are going to punish them." "We were hungry," said the boy, pleadingly, "and we found a hollow tree full of nuts, and ate them to keep alive. We didn't want to starve when there was food right in front of us." 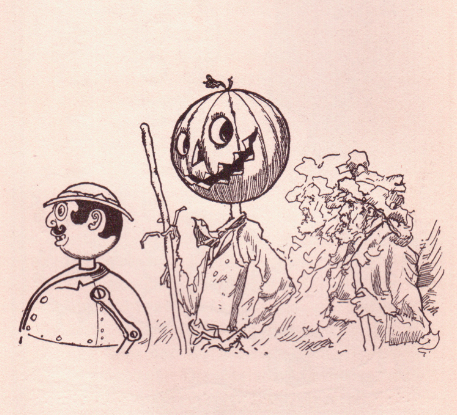 "Quite right," remarked Jack, nodding his pumpkin head. "I don't blame you one bit, under the circumstances. Not a bit." "Stop that!" cried the King Squirrel, chattering and whisking about. "You mustn't release our prisoners. You have no right to." But Jack paid no attention to the protest. His wooden fingers were awkward and it took him some time to untie the ropes. When at last he succeeded, the tree was full of squirrels, called together by their King, and they were furious at losing their prisoners. From the tree they began to hurl nuts at the Pumpkinhead, who laughed at them as he helped the two children to their feet. Now, at the top of this tree was a big dead limb, and so many squirrels gathered upon it that suddenly it broke away and fell to the ground. Poor Jack was standing directly under it and when the limb struck him it smashed his pumpkin head into a pulpy mass and sent Jack's wooden form tumbling, to stop with a bump against a tree a dozen feet away. He sat up, a moment afterward, but when he felt for his head it was gone. He could not see; neither could he speak. It was perhaps the greatest misfortune that could have happened to Jack Pumpkinhead, and the squirrels were delighted. They danced around in the tree in great glee as they saw Jack's plight. "Pick up the Pumpkinhead's body and set it on my saddle. Then mount behind it and hold on. We must get out of this forest as soon as we can, or the squirrels may capture you again. I must guess at the right path, for Jack's map is no longer of any use to him since that limb destroyed his head." The two children lifted Jack's body, which was not at all heavy, and placed it upon the saddle. Then they climbed up behind it and the Sawhorse immediately turned and trotted back along the path he had come, bearing all three with ease. However, when the path began to branch into many paths, all following different directions, the wooden animal became puzzled and soon was wandering aimlessly about, without any hope of finding the right way. Toward evening they came upon a fine fruit tree, which furnished the children a supper, and at night the little ones lay upon a bed of leaves while the Sawhorse stood watch, with the limp, headless form of poor Jack Pumpkinhead lying helpless across the saddle. Now, Ozma had seen in her Magic Picture all that had happened in the forest, so she sent the little Wizard, mounted upon the Cowardly Lion, to save the unfortunates. The Lion knew the forest well and when he reached it he bounded straight through the tangled paths to where the Sawhorse was wandering, with Jack and the two children on his back. The Wizard was grieved at the sight of the headless Jack, but believed he could save him. He first led the Sawhorse out of the forest and restored the boy and girl to the arms of their anxious friends, and then he sent the Lion back to Ozma to tell her what had happened. "Fine!" replied Jack, and shook the hand of the little Wizard gratefully. "You have really saved my life, for without your assistance I could not have found my way home to get a new head. But I'm all right, now, and I shall be very careful not to get this beautiful head smashed." And he shook the Wizard's hand again. "Are the brains in the new head any better than the old ones?" inquired the Sawhorse, who had watched Jack's restoration. "Why, these seeds are quite tender," replied the Wizard, "so they will give our friend tender thoughts. But, to speak truly, my dear Sawhorse, Jack Pumpkinhead, with all his good qualities, will never be noted for his wisdom." Add Jack Pumpkinhead and the Sawhorse to your own personal library.